For the Australian version, see Ford Fairlane (Australia). For the concept vehicle, see Ford Flex. The Ford Fairlane is an automobile model that was sold between 1955 and 1970 by Ford in North America. The name is derived from Henry Ford's estate, Fair Lane, near Dearborn, Michigan. Few changes were made for 1956; a four-door Victoria hardtop and two new, more powerful V8 options, of 292 cu in (4.8 L) and 312 cu in (5.1 L), the latter available up to 225 bhp (168 kW; 228 PS), were introduced. The Lifeguard safety package was introduced. The two-door Victoria hardtop featured a new and slimmer roofline. A one-year only two-door station wagon, the 1956 Ford Parklane, featured Fairlane-level trim. It was marketed to compete against the Chevrolet Nomad. For 1957, a new style gave a longer, wider, lower, and sleeker look with low tailfins. The new proportions and modern styling were a hit with customers to the extent that the Ford outsold Chevrolet in 1957 for the first time since 1935. A new top trim level was reversed, the Fairlane 500. For the first time, the lower-level Custom line had a shorter wheelbase than the Fairlane. Engines were largely the same as the year before. The big news for 1957 was the introduction of the Fairlane 500 Skyliner power retractable hardtop, whose solid top hinged and folded down into the trunk space at the touch of a button. Another facelift for 1958 had fashionable quad headlights, a grille that matched the 1958 Thunderbird, and other styling changes. New big-block FE V8s of 332 and 352 CID (5.4 L and 5.8 L) replaced the previous largest V8s, and a better three-speed automatic transmission was also available. A new top-level full-sized model was introduced at mid-year 1959, the Ford Galaxie. The 1959 Galaxie displayed both "Fairlane 500" and "Galaxie" badging. Full-sized Fairlane and Fairlane 500 models were restyled for 1960 and again for the 1961 model year. 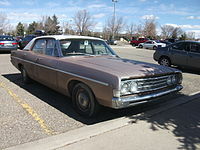 The Galaxie series continued as the top-of-the-line full-sized Ford. Fairlane 500s demoted to mid-level in the lineup and were equivalent to the Chevrolet Bel Air. Fairlanes were primarily sold as base level trim models for fleet use (taxi, police). Both were only available as pillared sedans. The big-block 390 CID V8 was available in 1961 as the top-horsepower option, as the "horsepower wars" in Detroit continued. The Fairlane name was moved to Ford's new intermediate, introduced for the 1962 model year, to bridge the gap between the compact Ford Falcon and the full-sized Galaxie, making it a competitor for GM's A-body "senior compacts", the Dodge Custom 880, and the AMC Rambler. With an overall length of 197 in (5004 mm) and a wheelbase of 115.5 in (2934 mm), it was 16 in (406 mm) longer than the Falcon and 12.3 in (312 mm) shorter than the Galaxie. Wheel track varied from 53.5 in (1355 mm) to 56 in (1422 mm) depending on model and specification. The Fairlane's standard engine was the 170 CID (2.8 L) six, but as an option, it introduced Ford's new, lightweight Windsor V8, initially with a displacement of 221 CID (3.6 L) and 145 hp (108 kW); a 260 CID (4.2 L) "Challenger" version was added at mid-year, with an advertised 164 hp (122 kW). The Sports Coupe option débuted mid-year and featured bucket seats and a small floor console. The trim level supplemented the Fairlane and Fairlane 500 trim levels (the 500 model had more decorative trim, such as a wider chrome stripe down the side and three bullets on the rear quarter panels). The Challenger 289 CID engine was introduced in mid-1963, with solid lifters and other performance pieces helping the engine produce an advertised 271 hp (202 kW); however, it was equipped with single exhaust like the less powerful engines. This engine was coded "K" in the vehicle identification number. Exterior identification was by fender-mounted "V" badges that read "289 High Performance". That same year, station wagons arrived, called the Ranch Wagon and Ranch Custom Wagon. All 1962 Fairlanes had "B" posts despite the popularity of the pillarless hardtop and convertible styles in that era. Ford saw the problem and introduced two pillarless hardtop coupes for 1963, in Fairlane 500 and Sports Coupe trim. For 1963 and later Sports Coupe models, the center console, which had come from the Falcon parts bin for 1962, was changed to be similar to that of the Galaxie. Sports Coupe models got a floor-mounted shift lever for the center console when Cruise-O-Matic or 4-speed manual transmissions were specified; however when the two-speed Fordomatic was ordered, the shift lever was installed on the steering column (and the console was the same without the shifter). Front-end styling for the 1963 models mimicked the big Galaxie models, but the rear end retained the small tailfins and "pieplate" tail lamp styling cues. The Squire wagon (a fake woodie) was available for 1963 only, including one model with front bucket seats. The "Swing-Away" steering wheel became an option in 1964. The 1964 and 1965, Fairlane ranges consisted of similar body styles: base Fairlane and Fairlane 500 two-door coupes and four-door sedans, and Fairlane 500 and Sports Coupe two-door hardtops. The Fairlane Squire wagon was dropped, but the standard station wagon was continued. The 221 V8 was dropped after 1963, leaving the six as the base engine and the 260 as the base V8. The "K-code" 271-horsepower 289 V8 continued into 1964, gaining dual exhausts, while a 195 horsepower (145 kW) version of the 289 with a two-barrel carburetor and hydraulic lifters was introduced. The two-speed Fordomatic continued as the automatic transmission choice for the 260 in 1964, while 289 V8s got the three-speed Cruise-O-Matic transmission option. All 1965 models featured 14-inch (360 mm) wheels as standard, in place of the earlier 13-inch (330 mm) wheels, and Fordomatic was finally phased out, leaving the Cruise-O-Matic as the only automatic available for the Fairlane. The 260 was also dropped after 1964, leaving the two-barrel 289 as the base V8. Styling-wise, in 1964, a new grille and headlight bezels were introduced, the tail fins were dropped, some chrome decorating on the side was changed, and the shape of the trunk lid changed. Styling features for 1965 included body-color headlight bezels for the deluxe models and rectangular taillight lenses, a return to the 1962-1963 trunk lid, along with less chrome on the body and a small standup hood ornament. 1964 Ford Fairlane 500 Sports Coupe. This example from Australia was modified to a right-hand drive model. As the muscle car market took shape, Ford built a small number of Fairlane two door hard tops prepared for drag racing during the 1963 season. These cars were running the 289 and were set up at Dearborn Steel Tubing that built the special cars for Ford special vehicle operations . These soon evolved into the "Thunderbolts" for 1964. The racing Thunderbolt was a two door post car, heavily modified to incorporate Ford's new 427 CID (7.0 L) V8 race engine with two four-barrel carburetors on a high-riser manifold, ram-air through the openings left by deleting the inboard headlights, equal-length headers, trunk-mounted battery, several fiberglass parts (hood, door skins, fenders, and front bumper), acrylic glass windows, and other lightweight options, including deleted rear-door window winders, carpeting, radio, sealant, sun visors, armrests, jack, lug wrench, heater, soundproofing, and passenger-side windshield wiper. The cars wore Fairlane 500 trim, and were only offered with the two-door sedan body. This special model, of which 111 to 127 total were made (sources disagree),[who?] delivered 657 hp (490 kW) at 7,500 rpm and was known as the Thunderbolt. Racing in NHRA Super Stock (which required only fifty cars be available to the public), on 7-inch (180 mm)-wide tires, the Thunderbolt was based on the midlevel Fairlane 500 two-door pillared sedan, and in 1964 set elapsed time and top speed records at 11.6 seconds and 124 mph (200 km/h). took the Super Stock title (with Gas Ronda taking the honors), and won the Manufacturer's Cup. The car as delivered was slightly too light to meet NHRA's 3200-lb (1451-kg) minimum weight unless it was raced with a full tank of gasoline, which would bring it to 3203 lb (1453 kg). NHRA rules at the time required a metal front bumper, so the cars began to be supplied with an aluminum bumper and previous purchasers were supplied with one. Thunderbolt production was ended due to NHRA rule changes for Super Stock competition, requiring 500 vehicles be built to be entered in that class. Ford had been losing $1500 to $2000 on each Thunderbolt sold at the sticker price of $3900. The first 11 Thunderbolts were painted maroon (known as Vintage Burgundy in Ford literature), the rest white; 99 had manual transmissions. Many are still raced. About 50 similar Mercury Cyclones were also produced by Ford in 1964, destined to be modified to represent Ford in A/FX competition, which they dominated, as well. These vehicles varied greatly in wheel track due to customer options for varying suspension and wheel/tire combinations. Front tracks from 54 to 56 in and rear tracks from 53.5 to 55.5 in were common. 3-speed manual, 4-speed manual, 3-speed "Cruise-O-Matic"
The Fairlane was revised in 1966. The appearance was changed to match the full-sized Ford, which had been restyled in the 1965 model year. The front end featured vertically stacked dual headlights. The XL, GT, and GTA packages were introduced, as well as a convertible to join the existing range of sedans, hardtops, and station wagons. The "K-code" 289 CID engine was dropped this year. The GT featured a 390 CID FE V8 as standard, while the GTA also included the newly introduced the SportShift Cruise-o-Matic automatic transmission. The GT/GTA 390 CID engine developed 335 bhp (250 kW) with higher compression, and had a four-barrel carburetor. Mid year, Ford produced 57 special Fairlane 500 two-door hardtops with "R-code" 427 cu in (7.0 L) V8 engine rated at 425 bhp (431 PS; 317 kW) @ 6000 rpm and 480 lb⋅ft (651 N⋅m) @ 3700 rpm of torque, equipped with Ford's "Top-Loader" four-speed manual transmission. Built to qualify the engine/transmission combination for NHRA and IHRA Super Stock racing, they were white and had fiberglass hoods with a forward-facing hood scoop which ended at the edge of the hood. The Fairlane Squire wagon was reintroduced for 1966. Minor trim changes were introduced for 1967 as the Fairlane was mildly facelifted. The 289 CID small-block became the base V8, with a 200 CID six standard, with the 390 CID optional (with either two- or four-barrel carburetor, at 275 and 320 bhp (240 kW), respectively). The 427s were still available, either with a single four-barrel carburetor or dual quad carbs, developing 410 (W-code) and 425 bhp (R-code), 427s were available on XL models, but very few were built. The notable addition for the 1967 model year was a Ranchero pickup as part of the Fairlane range (from 1960 to 1965, the Ranchero was based on the Falcon, while in 1966 it used the Fairlane platform but Falcon styling). The 1967 Fairlanes also included a number of federal government-mandated safety features, including a new energy-absorbing steering column with a large padded steering wheel hub, soft interior trim, four-way hazard flashers, a dual-chamber braking system, and shoulder belt anchors. The convertible had a tempered safety glass rear window. Two different two-door coupe models were offered. The lower-end Fairlane Club Coupe had pillars around the rear windows, while the higher trim level was a pillarless two-door hardtop, similar to the convertible. A redesign was introduced for the 1968 model year. The wheelbase remained at 116 in (2,946 mm), but it grew in other dimensions. They were about four inches (102 mm) longer and 200 lb (91 kg) heavier than the cars they replaced. A fastback Sportsroof model was introduced in the Fairlane 500 series, as well as a more luxurious Torino model at the top of the intermediate range, contributing 172,083 of the Fairlane's 371,787 units sold that year. In a cost-saving decision, the station wagons carried over the 1966-67 bodies from the cowl back. The Ranch Wagon model name was deleted; Fairlane wagons had either the base or the 500 trim. Base hardtop sales more than doubled, to 44,683 units. The base engine was the 200 cu in (3.3 L) I6, with several optional V8s. Early production 1968 base V8 Fairlanes were equipped with the two-barrel 289 cu in (4.7 L), while later units came with the 302 cu in (4.9 L). The GTs were part of the Torino range, with the 302 CID V8 standard, with optional engines being the 390 CID V8 in two- and four-barrel versions. The 390 four-barrel was supplanted mid-year as the top performance engine by the 428 cu in (7.0 L) Cobra Jet, developing 335 bhp (250 kW). There was also a 428 cu in (7.0 L) Super Cobra Jet. The Ranchero coupe utility body style was available in standard, 500, and GT versions. The Cobra was introduced in 1969 as a competitor for Plymouth's Road Runner. Basic models featured the 302 CID V8 and three-speed manual transmission as standard. Options included the 390 CID and two 428 cu in (7.0 L) V8s. The Cobras had a standard 428 CID V8 rated at 335 bhp (250 kW), while options included bucket seats, hood scoop, clock, tachometer, power disc brakes, and 4.30:1 rear axle gearing. "Regular" Fairlanes and Rancheros continued, all with bucket-seat options. Ford's intermediates grew again in 1970, now with a 117 in (2,972 mm) wheelbase. At the start of the model year, only the Fairlane 500 remained as the base trim model in what was now effectively the Torino series. The straight six-cylinder was the economy power, while largest engine was now a 429 cu in (7.0 l) with four-barrel carburetor and 360 bhp (270 kW), on the Torino Cobra. Different heads were optional and gave the Cobra 370 bhp (280 kW) and higher compression. Other options included the Cobra Jet Ram Air 429, though Ford quoted the same power output, and the Drag Pack rated at 375 bhp (280 kW). However, the 1970s were slower than the 1969s, and race teams were forced to run the older models. The 1970½ Ford Falcon 2-Door Sedan. The 1970½ Falcon was a low-priced version of the 1970 Fairlane 500. The four-door sedan of the 1968 body style was built in Argentina from 1969 to 1973 and the 1969 body style from 1973 to 1981 under the Fairlane name with three equipment packages: Standard, 500 and LTD. The car was similar to the American model except the engines. The two options were a 221 CID 6-cylinder with 132 hp (98 kW), and the old 292 phase I (1969–1971) CID "Y-block" V8 which had been last used in the 1964 F-Series truck; it was rated at 185 hp (138 kW), in 1971 the Ford Motor Company Argentina decided to make an improvement on the 292, was started by the covers mainly the problem of spark plugs was solved by giving an inclination towards the front of the engine that allowed an easier extraction in the car, changed the opening order and exhaust cam, valves larger intake (of the 292 heavy duty American) were placed, fuel lines making them more direct was improved with a new admission very similar to that of the small block 289, 302 pistons maximum compression with lomo brand Buxton were used, raising the compression at 8 to 1, allowing the engine erogue 185 HP at 4500 rpm, another improvement were leaks with individual manifold runners, eliminating the original American system of a manifold connected to another in series, used in trucks, in cars they were always individual. Distributors are different in coupling, calling FASE II . In 1978, the LTD "Elite" option was introduced as the most luxurious made in Argentina. By the end of production in 1981, almost 30,000 Fairlanes had been made. Ford manufactured the Torino in Venezuela marketed as the Fairlane and Fairlane 500. These cars were identical to the U.S. Torino through 1976 and both base Fairlane and upscale Fairlane 500 used the "base" Torino grille. For 1977–1979 the Fairlane was based on the American LTD II. At the 2005 Auto Show circuit, Ford revealed a new concept car with the Fairlane nameplate. The "people-mover" Fairlane crossover utility vehicle concept featured three-row seating for six passengers, and previewed the chromed three-bar horizontal grill design, which currently appears on the 2006 Ford Fusion sedan and 2007 Ford Edge crossover utility vehicle." A production version of the Fairlane concept, now called the Ford Flex, debuted at the 2007 New York Auto Show, and entered production for the 2009 model year in summer 2008. Unlike the concept, the production model comes with seven seats. It is built on the Ford D3 platform, which is also used by the Ford Taurus, and Mercury Sable. It is intended to replace the people-mover capability of the Ford Freestar minivan. ^ "Facilities | Ford Motor Company Newsroom". Media.ford.com. Retrieved 2010-10-19. ^ "1963 Ford Fairlane Brochure". lov2xlr8.no. Retrieved 4 December 2018. ^ "1965 Ford Brochure". lov2xlr8.no. Retrieved 4 December 2018. ^ "1962 Ford Full Size Brochure". Oldcarbrochures.com. Retrieved 29 March 2016. ^ "1964 Ford brochure 1". Oldcarbrochures.com. Retrieved 2011-11-20. ^ Adolphus, David Traver (August 2008). "1964 Ford Fairlane 500 Thunderbolt". Hemmings Muscle Machines. Retrieved 29 March 2016. ^ Gunnell, John (1 April 2002). Standard Catalog of American Cars, 1946-1975. Krause Publications. ISBN 978-0-87349-461-8. Retrieved 24 February 2013. ^ "1966 Ford Fairlane". myclassicgarage.com. Retrieved June 23, 2018. ^ "1967 Ford Full Line Brochure". Oldcarbrochures.com. p. 9. Retrieved 29 March 2016. ^ a b Grey, Jim (March 23, 2013). "1968 Ford Fairlane GT – The Unexpected Wallflower". Curbside Classic. Retrieved October 3, 2015. ^ Flory, J. "Kelly", Jr. (2004). American Cars 1960-1972. McFarland. p. 599. ^ "Fairlane Registry 1968 VIN Codes". FordFairlane.com. Retrieved 2010-10-19. ^ "Fairlane Argentina 2.0" (in Spanish). www.fairlaneargentina.com. Retrieved 29 March 2016. ^ "2005 Chicago Auto Show: Ford Fairlane Photo Gallery." Motor Trend, 2005. ^ Nevin, Brad. "Ford Fairlane Breaks New Ground as a People Mover Archived 2006-08-12 at the Wayback Machine." Ford Communications Network, 9 December 2005. ^ "Ford Fairlane Concept." Automobile Magazine, 2005. ^ "Ford OKs Fairlane, Keeps Town Car". Ward's AutoWorld. 1 October 2006. Retrieved 29 March 2016. ^ "Ford Develops People Movers to Replace Minivans Archived 2007-03-23 at the Wayback Machine." Car and Driver. Wikimedia Commons has media related to Ford Fairlane. This page was last edited on 21 April 2019, at 23:05 (UTC).